Alternative 63mm ceramic liners in this extremely severe insert chute were lasting less than 6 weeks. The lump and fine iron ore had a drop height of 12 to 13 meters at high velocities. To achieve optimal operating efficiency, the client required a service life of at least 24 weeks. 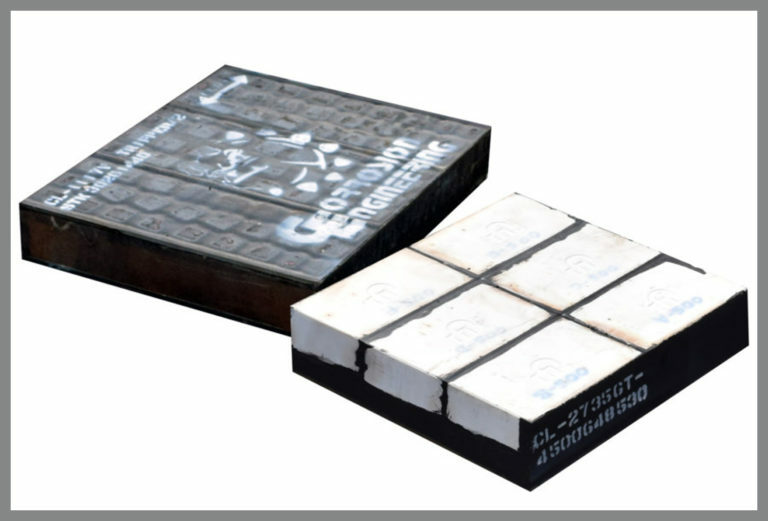 With the need for a premium solution, Corrosion Engineering designed and developed a CorroTile wear lining system for the primary wear area of the insert chute using Corrosion Engineering’s top performance, proprietary ceramic compound G-Series. The installation took place October of 2015. After 5 weeks (20th November, 2015), the CorroTile system was in great condition. The majority of alternative liners at this stage would have failed. After 14 weeks in operation (21st January, 2016), an inspection of the CorroTile G-Series showed good operating condition with zero holes, chipping or cracking of the liners or ceramic. The CorroTile lining system lasted 30 weeks in service before being replaced. This CorroTile lining system proved its superiority in this study, lasting over 5 times longer than alternative ceramic liners. The extremely high performance of CorroTile allowed the client to achieve optimal operational efficiency while also achieving a generous return on investment.